What do the state of North Carolina, mouse immune systems, and HIV infection in Uganda all have in common? They each played a pivotal role in the story of how, exactly three years ago this month, I came to found The Reagent Project (TRP)—and began a quest to level the playing field for scientists, no matter their national origin or the wealth of their research institution. Columbia University days. From left, Drs. 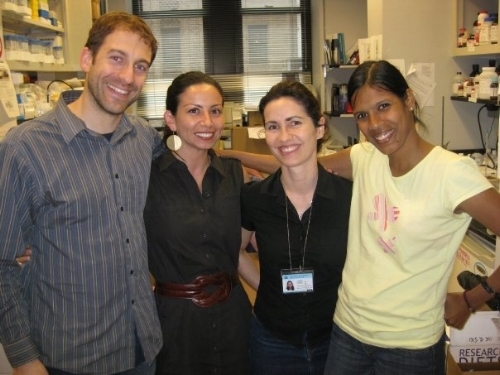 Geoffrey Catalano, Marcella Flores, Lucrezia Colonna, and Nina Shah. Back then, I was completing a post-doc in viral immunology at Columbia University—which, needless to say, is well endowed and stocked with all the latest and greatest reagents and lab equipment. 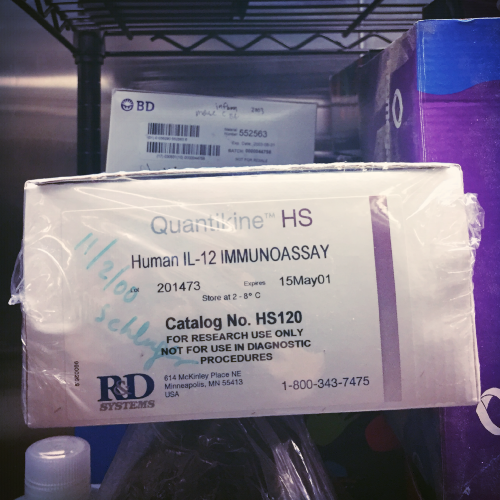 As part of a project I was conducting, I purchased a kit of reagents to investigate mouse immune responses. It cost $5,000. To Columbia this is nothing. But for many other scientists, both in the U.S. and abroad, it is a prohibitive expense, preventing them from testing vital hypotheses that could prove key in understanding diseases as varied as Dengue virus and Lupus—which both afflict millions and remain difficult to treat and control. Here in the U.S., where the share of basic research funding provided by the federal government dropped from 70% in the 1970s to 44% in 2015, support for scientists not working for private corporations is harder and harder to come by. And the problem is much worse in developing regions. For example, although sub-Saharan Africa bears a disproportionate share of many of the world’s deadliest diseases, it does not have the research capacity to develop the homegrown solutions that could best combat them. In fact, less than 1% of the world’s biomedical publications come from the region, according to the World Bank. And with an average life expectancy of 60 years—approximately 20 years less than in highly developed countries—its lack of more robust health and research infrastructures clearly has deadly results. After snapping up that pricey reagent, I ran my experiment and lo and behold, my hypothesis was wrong…and I wouldn’t need to use the 10 other brand new, perfectly good tests that came with the kit. Generally, they would have been tucked away in the back of the fridge for a rainy day—or until they were dug up, archaeological-style, by another grad student decades later. But like any good Californian, the waste struck me. So I combed through ResearchGate.com (like Facebook but for scientists), and located Angelica Martins, a grad student at the University of North Carolina, Charlotte, who, in an effort to save cash, was attempting to build a homemade kit to study viral immune responses. After wasting months of my life, I knew that the homemade version was never going work. So I shipped my unused kits south, and Angelica completed her study. I wanted to continue with my newfound mission to simultaneously reduce waste at well-funded labs while improving research at those with less access to equipment and reagents. But I didn’t know where to start or how to be most helpful. 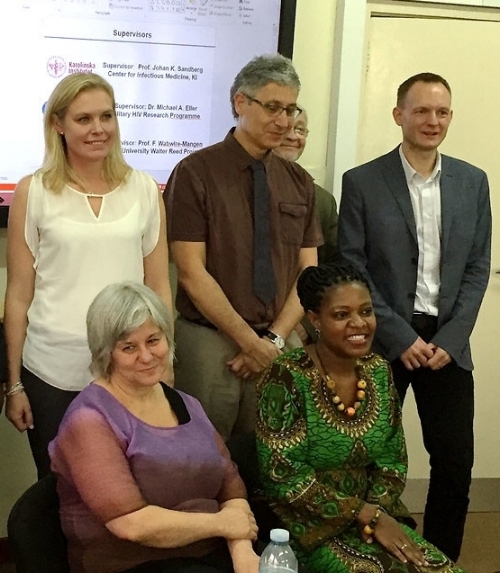 Then, I met Dr. Prossy Naluyima, a scientist researching HIV and other health risks in Uganda at the Makerere University Walter Reed Project in Kampala. Prossy and I were presenting research posters next to each other at the Keystone Symposia on Molecular and Cellular Biology, and we got to talking. And soon we couldn’t stop. She explained to me the cost to her own research and scientific investigation across Kampala caused by the lack of access to expensive lab products. She told me that because her funding came through clinical trials, she was limited to conducting those—and could not investigate her own hypotheses based on her knowledge of local disease risks and lived realities. And she’s one of the lucky ones. According to a 2011 study in the African Journal of Health Professions Education, only 6.7% of surveyed researchers in sub-Saharan Africa work in clinical trials. Most lack access to sophisticated lab equipment period. In fact, in a 2016 survey, 76% of African scientists reported lacking access to the hardware needed to conduct their current research and 93% to what would be required to pursue the future research they desired. In addition, 91% said that their universities lacked the supplies needed to adequately training aspiring undergraduate scientists—limiting the next generation of innovation. Thanks to Prossy, I then had my eureka moment—I should take the quest to send researchers in need unused items collecting dust in labs like Columbia’s global. A few months later, in May 2015, I filed a Certificate of Incorporation with the state of New York—and TRP was born. And today, in honor of that anniversary, I’d like to send a shout out to Prossy, Angelica, and our founding donors who have contributed to #ScienceForAll and gotten us where we are. A monthly newsletter with the latests on our client's innovative work, weird new science and behind the scenes stories that fuels The Reagent Project.